James J. “Whitey” Bulger is one of the most notorious gangsters in American history. He is responsible for at least 19 murders plus extortion, racketeering, and drug trafficking. With Steve Flemmi and Kevin Weeks by his side, Bulger and The Winter Hill Gang terrorized South Boston for decades. The actual events of Whitey Bulger's life are so damn interesting that a Hollywood version of his life should have given us a better movie than the final product of Black Mass. Black Mass is directed by Scott Cooper. The film uses the same techniques that Cooper has used on Crazy Heart and Out of the Furnace, his first two feature films, and Cooper's fingerprints are very much on all three of his movies. All three films are methodically paced, bleak-looking, character-driven, and frankly often times outright boring. I actually enjoyed Out of the Furance, but I understand its 53% Rotten Tomatoes score. Crazy Heart, despite being an excellent showcase for Jeff Bridges' talent, is a dull and meandering film. Black Mass pulls a little bit from both of Cooper's previous films as this is an excellent showcase for Johnny Depp as Whitey Bulger but moves with a sense of purpose from scene to scene. All three of Cooper's films are extremely character-driven, often times to the story's detriment. That was the case here with Black Mass as this story deserves an action-packed, fast pace script. There was no reason Black Mass couldn't be this generation's Goodfellas- interesting characters that were fun to be with that, while still being plot driven, never lost sight of its characters. Unfortunately, I'll have to "settle" for this generation's actual version of the Whitey Bulger story- The Departed. "...and God help you if you use voice-over in your work, my friends. God help you! It's flaccid, sloppy writing. Any idiot can write voice-over narration to explain the thoughts of a character. You must present the internal conflicts of your character in action." Anyone who has ever taken an introduction to film writing class (raises hand) knows that it is a Cardinal Sin to use voice-over work. You are supposed to, say it with me now, show, not tell. However, we know that this generic, broad rule is not true. It's not that you're never allowed to use voice-over work, it is that you're not allowed to use it as a crutch for your storytelling and character development. However, this archaic belief that you are never allowed to use voice-over means that it's rarely used in the visual medium. That means when it is used, it's seemingly always discussed. That's why it has become a discussion point for two of 2015's best (and new) show TV shows of the year- USA's Mr. Robot and Netflix's Narcos- both of which owe a debt of gratitude to The Godfather of voice-overs: Goodfellas. Goodfellas is most certainly not the first film to use voice-over. Blade Runner used voice-over. A Clockwork Orange used voice-over. Most film noir films used voice-over. 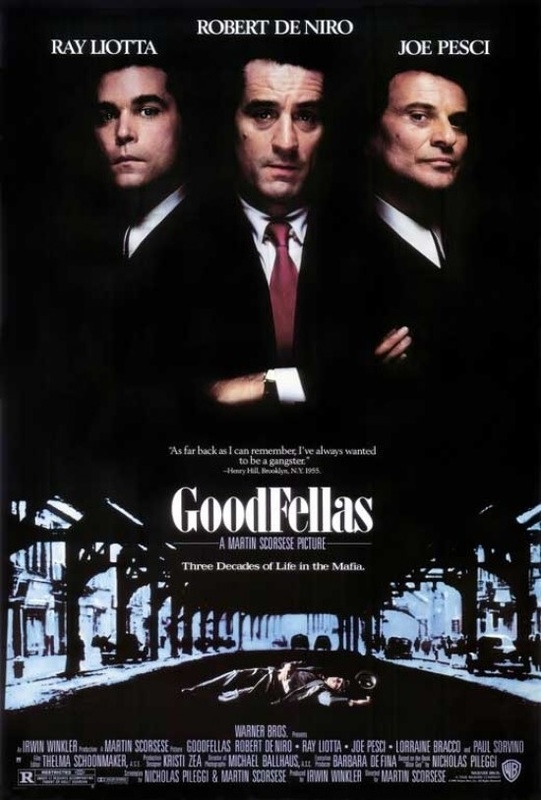 However, Goodfellas perfected and solidified the use of voice-over. The film follows Henry Hill (Ray Liotta) and uses his narration to describe his ascent and fall from his mafioso life. The film starts off with Hill saying, "As far back as I can remember, I always wanted to be a gangster" and uses Hill's perspective to tell this incredible story of his life in the mob. The use of voice-over is effective in multiple ways throughout the film. We get a clear vantage point for how this story is told, we're able to get a sense of how deep and connected this world is, and it's even used to heightened tension and advance plot. Director Martin Scorsese still gives you wonderful characters- Joe Pesci won his sole Academy Award for his work in the film- and gives you an interesting and engaging take on the mob genre, but also uses voice-over to coalesce the entire project and gel everything together. There are a lot of things that make Goodfellas IMDB.com's 17th best movie of all time and rank it on AFI's top 100 list, but there should be no denying that Ray Liotta's voice over work is one of those reasons. Goodfellas' voice over just works, and because it was so effective, it helped inspire movies and TV shows for years and decades to come.